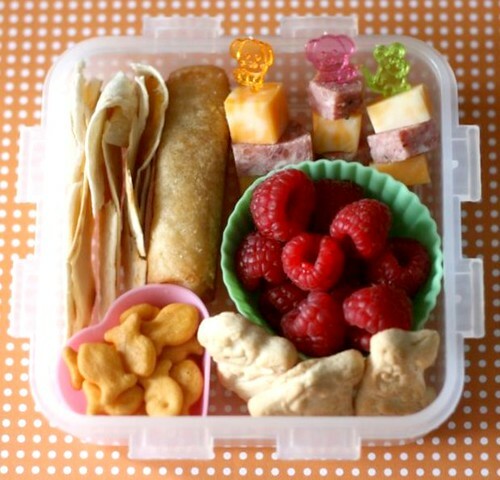 This is a smorgasbord bento for my 2-year-old daughter. It is packed in a small Lock and Lock box - smaller and more shallow than the regular "4 square Lock and Lock" I normally use. This one is just sandwich sized. In the top left are tortilla strips (really, just the "crusts" of a quesadilla, my son won't eat the edges and she will, so...), a leftover spring roll from my husbands dinner the other night, some mini kabobs of colby cheese and summer sausage. Rounding the right side and to the front left corner are a silicone cup holding raspberries, some of those never-ending Pooh animal crackers, a tiny heart shaped silicone cup of baby Goldfish crackers. The first thing my daughter did with this lunch was pull the cheese and sausage off the picks and throw the picks to the floor. She was definitely not as taken with them as she was the pink kitty pick yesterday. She was also not very keen on the spring roll. It has been a long time since she's had those, she used to gobble them up. I hope this isn't a sign she's turning picky on me! But seriously, ditch the brown bag. Nothing green about that!!! Aren't you the terracycling queen? Hmmm?